When I ordered Seatern I selected white for the hull since Matt suggested all colours fade. He also suggested that, rather than have a contrasting boot-top, the anti-fouling could extend above the waterline region. 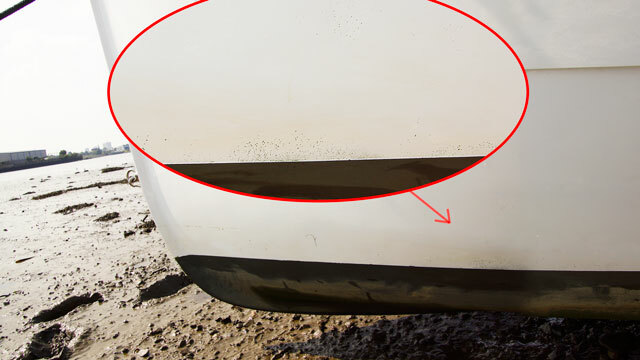 However when Seatern was built the anti-fouling was only taken to the waterline. There were also various flaws in Seatern’s original paintwork which only became obvious after she had been delivered. There was some small “pitting” mainly in the bow region near the waterline which was only obvious once weed started to establish on it. 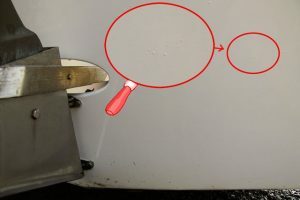 There were also small blisters in the paintwork, almost entirely on the transom which seem to vary in size with the weather. I was most concerned with the pitting because it created an easy foothold for weed growth so I contacted Matt in late summer 2014. 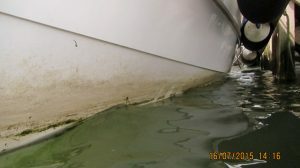 Matt was shocked to see photos of the problem areas and arranged to look at Seatern during the 2014 Southampton boat show with the necessary remedial work to be done under warrantee. 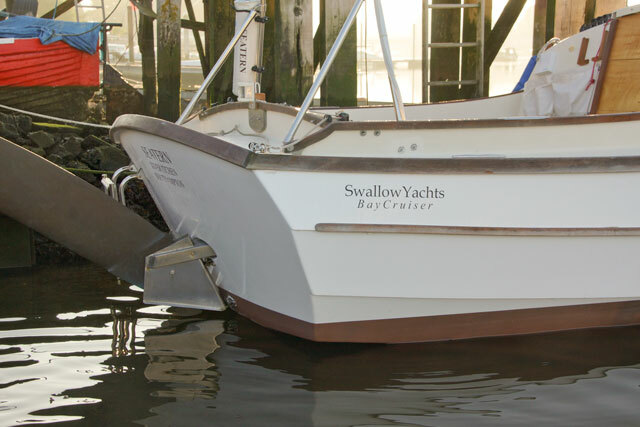 Matt was most concerned by the blisters on the transom and arranged to have these inspected by a representative from the paint suppliers. The resulting report was fairly inconclusive – possibly there was too much humidity when Seatern was painted – which was December 2013. Since the paint finish was intact, the problem was not considered urgent, and at my suggestion it was agreed to do the remedial work the following summer – August 2015. Thus, when I damaged Seatern’s stem on the 23rd July, it was only a case of taking her to Swallow Boats/Yachts a week or so earlier than had been arranged. Matt was on holiday but Jonny dealt with the arrangements very efficiently. It was agreed to raise the “waterline”, that is the top of the anti-fouling to a point just below the lowest point of the chine and to curve it upwards towards the bow and stern. The shape of the hull creates an illusion that this line is straight despite the curve! Given the need to repair the stem, I agreed to have the whole of the hull paintwork redone, part of which was covered by the warrantee work. So Seatern now has a new “waterline” – the photos of it here were taken with the boat more or less empty and no water in the ballast tanks, she will normally sit lower. The new paint work is excellent. 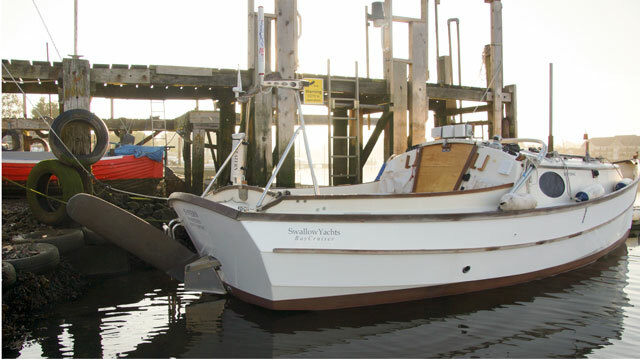 Since Seatern was built Swallow Boats have the new large workshop, a new paint facility, and employ a paint specialist. As a result they can produce a much improved paint finish. And Seatern is now a “Swallow Yachts BayCruiser”!